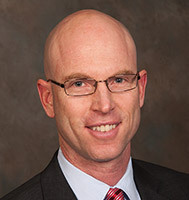 Dr. Seth Williams specializes in minimally invasive spine surgery, CT-navigated surgical techniques and complex cervical and lumbar spine surgery. He also treats extremity fractures as a member of UW Health's Trauma Surgery team. If you have a spine condition and surgery has been recommended, and you wish to have Dr. Williams review your X-rays or MRI or CT images to determine if you may be a candidate for minimally invasive surgery, contact the Spine Clinic at (608) 265-3207. Minimally-invasive spinal surgery techniques in the treatment of spine trauma. Percutaneous minimally-invasive lumbopelvic stabilization techniques in the treatment of sacral fractures with spino-pelvic dissociation patterns. Comparison of blood loss in minimally-invasive transforaminal lumbar interbody fusion compared to conventional open surgical techniques. Posterior lumbar interbody fusion rates using structural allograft bone and local autograft bone graft. Minimally-invasive percutaneous and open techniques for iliac screw placement with CT confirmation. Intraoperative fluoroscopic techniques to detect pedicle screw breech. Biomechanical analysis of short-segment spinal fixation techniques in the treatment of thoracolumbar trauma. Minimally-invasive stabilization in spine trauma, tumors, and infection.